We both have a long history involving Ranching. We both grew up on working cow calf ranches, and our love of the lifestyle has carried over into our marriage. Growing up on beef cattle operations and showed us we wanted something a little more specialized after we were married, so we chose Miniature Texas Longhorns. The miniature longhorns started on a whim, or maybe a early marriage disagreement! Weldon had something specific in his mind for us to put in the front pasture that everyone would see when they drove by, and I had a completely different idea! The craziest thing I could think of was a mini longhorn, so I said “ Fine! Mini Longhorns it is! !”, we laughed and laughed and the more we researched them the more we began to fall in love with them. We have grown our herd over the past few years, to get to the point we are at now. We try to specialize in Miniature Texas Longhorns with great size, amazing disposition, fabulous coloring, and above all else fantastic horn length, shape, and over all appearance. We pride ourselves on animals who are pets, not livestock. We are very passionate about furthering the Miniature Texas Longhorn breed, from showing our animals to educating the public about them. It’s amazing how far this breed has come, but so many people are still unaware of the breed at all. 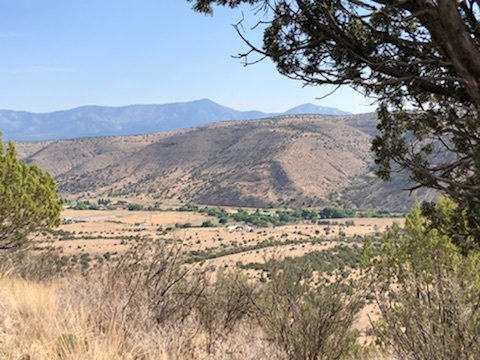 We chose to make our home in the beautiful Sacremento Mountains in south central New Mexico, just outside of Ruidoso and the Lincoln National Forrest. We are just a stones throw away from Historic Lincoln, New Mexico where the famous Lincoln County Wars were fought by Billy the Kid and compatriots. The beautiful Bonita River sets a background for our mini longhorns, and they seem to thrive in the mild climate we have here. So please, give us a call and come by for a visit and see if you wind up falling in love with Miniature Texas Longhorns just like we did!